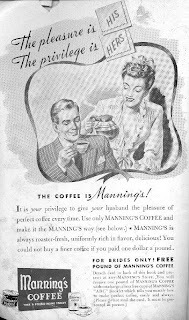 I want to share some vintage Coffee ads I stole found. Some are self explanatory, and some are just funny. AND...there were some that I decided not to use because they would be considered vulgar today....you know, how some words have totally different meanings today? Grandma J is all about being PC. Let's start out with a bit of chauvinistic brainwashing and helpfull hints for the new bride, shall we? I don't think the megaphone comes with it. Read the instructions on on how to open the can! Who knew that caffeine was the devil? I don't know about you, but there are days that Grandma J thinks caffeine is her best friend. 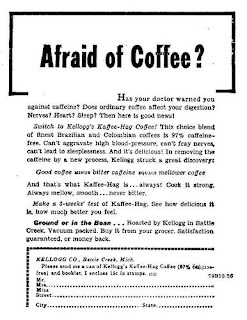 Kelloggs jumped on the decaffeinated bandwagon too! The A & P was all about elegance in the 40's and 50's. Good china...silver coffee servers...fresh flowers. Grandma J is almost certain these ads played a major role in molding Martha. By the mid 50's everything was starting to take on an aeronautical flavor. Jet this, jet that! 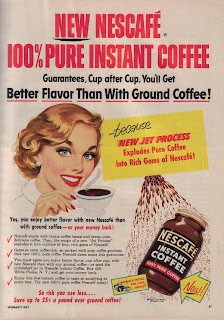 And be honest....was anyone convinced that instant coffee tastes better than fresh ground coffee? 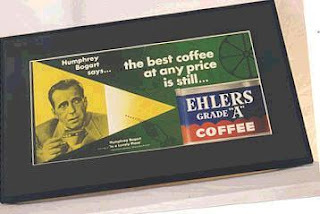 The Council on Coffee started using celebrities to push coffee down our throats in a big way after WWII. Ok, so I'm not sure there was a Council on Coffee, I made that part up. 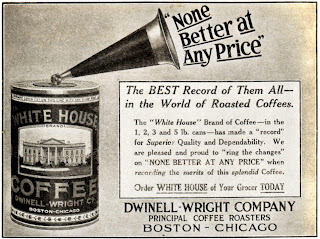 In any event, the ads were usually generic and Edward R. Murrow was someone everyone listened to. This ad wasn't generic....but the next one is. John Wayne....an American legend for sure. Maybe Grandma J is a bit biased, but she met John Wayne several times and he was a humble genuine man. 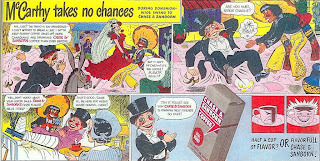 This is a lame comic strip...but then I've never found Charlie McCarthy stuff that funny. Maybe because Grandma J's brother had a Charlie McCarthy puppet and he would torment her with it. 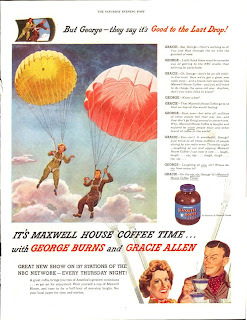 George Burns and Gracie Allen....who doesn't miss them? Don't you just love old vintage ads? Please take a few minutes to check out more C words at A to Z Mondays! Go on, you have time...and if you please feel free to join in! Great post - love the pictures. I never see Eight O'Clock coffee without thinking about my cousin's son who called it "AP Hot" since the coffee was always bought at the A& P and he wasn't allowed to touch it since it was "hot." I dearly love old ads! I love the false teeth one. That would be fantastic framed:) Now I'm off to Google those vulgar coffee ads!! And, yes, I miss George and Gracie. What, no ads with Juan Valdez picking only the best Columbian beans? Don't you remember those ads? 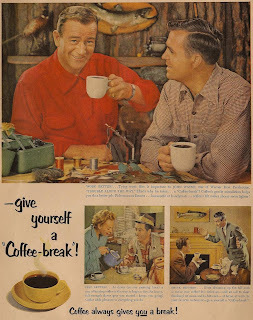 Love the old ads, and I LOVE 8 o'clock coffee to this day. Miss the A&P. Have you written about your encounters with John wayne? Because i'm sensing that's a good story. Also, the one about your brother torturing you with the McCarthy puppet. Oh boy do I smell a good story. I DO love the old vintage ads. Such an interesting window into the past. 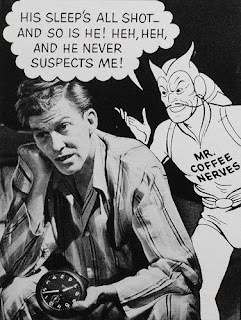 And no, caffeine is not the devil! Love love love Coffee! Great post! I do love those ads! Especially the His Pleasure one : ) How great is that! I think they should bring that ad back! Can you even imagine the drama that would create! I can just picture it now! Thanks for the tour down memory lane regarding the essential morning starter of everyone's day! how in the world did you find the time to put this together considering it's Christmas. Don't tell me you are all ready for the big day!!! Those old ads are just the best. And I do love a good cup of coffee GJ! Almost as much as you! Yes, I've always loved vintage ads, too. Caffeine is not the devil! And there is a Santa Clause!